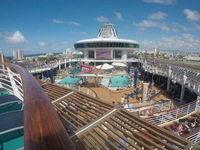 Overall this trip may have been my favorite cruise on Royal Caribbean. One thing I really liked is that we went down to San Juan a day before our ship left to get a full day 1 of our cruise. We stayed at the Hampton Inn and had good service. The next morning at 11:00 we left our hotel and got an Uber. You can not get on the ship before 12:00. Because we are Emerald members we got to skip the big embarkation line. 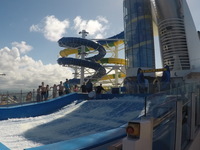 The ship had been recently updated with a FloRider and waterslides. The fun waterslides had a clear plastic part so you could see over the ocean. Everything was very clean and updated to a modern level. We had better entertainment on Oasis and Allure, but the comedians were very good. As always, the food was spectacular and came in great portions. On my 4 cruises with Royal Caribbean, I have never seen a unhappy crew member. They are all so nice! I would never go to a different cruise line. But I would gladly go again! Amazing ship, would definitely recommend! This is the Royal Promenade, which is like a mall. The upgrades had waterslides and a FloRider. 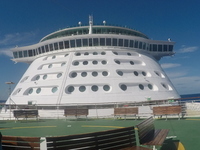 A cool view from the bow of the ship. This is a photo of the updated pool deck. The cabin was your standard interior stateroom. However, since it was recently remodeled with new carpet, bathroom, and paint it was quite nice. 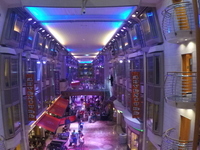 Everything was clean and just as good as on large Royal Caribbeans ships. A boat took us to a submarine that was in the water. The submarine went past 3 shipwrecks and then the captain sat the vessel down on the ocean floor.